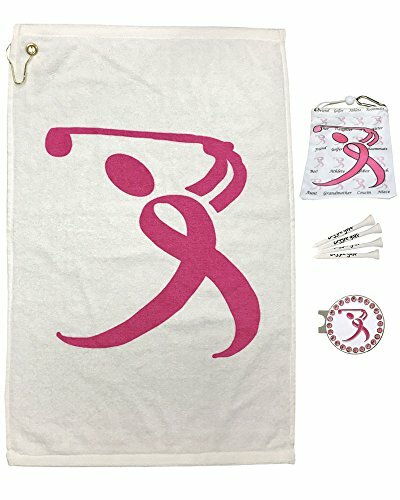 The Pink Ribbon Golfer Par 3 has one Pink Ribbon Golfer towel, one Pink Ribbon Golfer tee bag & 4 Giggle Tees, and one bling Pink Ribbon Golfer hat clip ball marker. Comes in a cute little mesh bag. SWINGING FOR THE CURE - Show your support for the fight against Breast Cancer by sporting our Pink Ribbon Golfer Par 3. Honor a survivor or remember a loved one as you seize the day on the golf course. GREENSIDE TESTED - New Bigger Size! This 16" x 25" lightweight golf towel comes with a corner grommet and hook, and is 100% cotton. GOLF BAG APPROVED - This micro-fiber material tee bag is 4.5" x 5.5". It has a drawstring closure and a clip to hang on your bag. GIFT GIVING GURU - Like all of our products, Giggle Golf Par 3 Packs make perfect gifts and prizes. This pack includes: 1 towel, 1 tee bag with 4 tees, and 1 bling ball marker on a standard hat clip that has a 10mm magnet, and fits most hats and visors.